Which is better for your store? What’s so great about incense anyway? It seems like candles are more popular, since you see them everywhere from WalMart to your corner drugstore. However, that’s exactly the reason why we think store owners benefit more from selling incense than candles. Incense users frequently become fiercely loyal to the brand and fragrances that they prefer. They will return again and again to your store to get their favorites. Incense generates quicker repeat sales. Each stick burns down completely in about an hour. An average size candle can take weeks to use up, and many end up never being used anyway. It’s easier to sell a $2 pack of incense than an $8 candle. It’s an impulse buy. 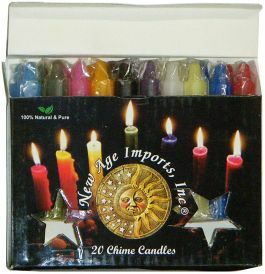 Candles are so common and easily available. They do not provide your customers a compelling reason to come to only your store to buy them. But incense is a powerfully growing market. Now is the time to make money with it. Having incense available for sale automatically creates a need for lots of incense burners. There are so many beautiful and cool incense burners being made right now. Most of your customers will need at least a basic wooden burner to catch the ashes. Incense gives a quicker bang for your buck than candles. After 10 minutes you’re still waiting for a scented candle to fill the room with fragrance, but with an incense stick you’re floating in fragrance after only a few minutes. It also does a much better job of covering up stinky pets than candles. You can provide your customers a great selection of fragrances in a much smaller space than with candles. For example, the WildBerry brand of incense offers about 90 fragrances, is incredibly popular, and each fragrance only takes up the space of one mason jar. Shipping costs for candles are much higher. They’re heavy! Plus they can melt in the summer on the hot UPS trucks, and are easily dented. On the other hand, incense is not fragile at all and is rarely damaged. Incense is no longer a just hippie thing. With the beautiful packaging and displays available today, it has become an affordable luxury item that is enjoyed by more and more people. One final bonus: bulk incense makes your store smell great. WildBerry brand incense is famous for luring people over by its scent alone. Once a customer comes over to the display, they are tempted to sample the many scents.